Paste the code snippet into your web page HTML editor, text widget, etc. YouTube channels can be embedded in a website as RSS feeds and FeedWind can display them all. This allows you to publish one or more YouTube RSS channel feeds through a widget on your website. YouTube no longer provides RSS feeds from subscriptions – RSS is only available from a channel ID or a specific user ID. The YouTube v2.0 API is now deprecated, so older URL parameters will not now work with current YouTube feed URLS. You can find out how to locate your YouTube Channel/User ID here. Select any parameters that you might want to adjust such as colors and design options and then open the General section, >Advanced Settings and ensure that “Thumbnail Resizing” is set to “Auto” or set the “Style” to Text only. Either setting will work fine with YouTube videos. In the current version of FeedWind it is not possible to adjust the YouTube player thumbnail size/dimensions. To display a YouTube video player in your feed, open the Feed Content section >Advanced Settings and click on the Display YouTube player button. You can display either a podcast icon (for sound only), or the YouTube video player interface (to play audio or the video) or hide them both and display just a text link to the media. Switching to “Content Only” in the Feed Contents section removes the text and leaves just the YouTube player behind. The Time/Date can also be toggled to “off” here if required. If you need to display RSS feeds from multiple YouTube channels, you can use multiple RSS feeds aggregated into a single feed. YouTube is organized much like many other places that offer continuously updating content. In their case they use “channels” which are organized just like TV channels, by topic, genres, age group etc. The main difference is that a YouTube channel can be started and run by anyone as they are free and not subject to broadcasters fees etc. that TV stations must adhere to. This has made YouTube into the world’s largest broadcaster so anyone looking to find suitable content to feed into their site need look no further. Content from YouTube is also royalty free as long as it is used within the scope of the YouTube Terms of Service. This makes YouTube an ideal source for material for any website. There are 8 years of content uploaded every single day to YouTube – a simply staggering amount of content! 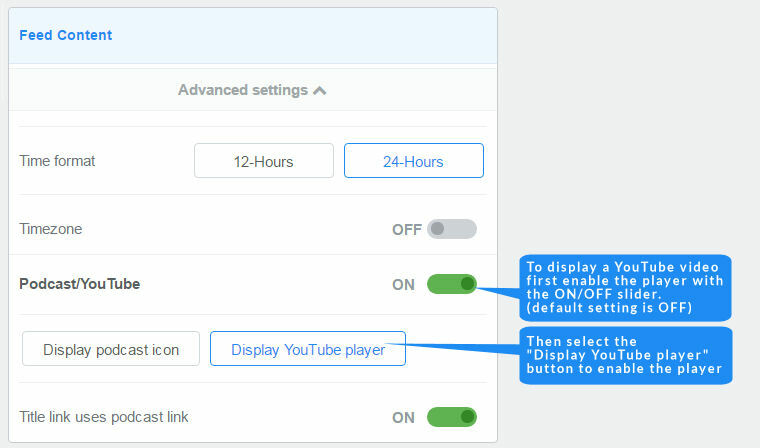 Whatever your YouTube channel offers, it can be fed to any website through a FeedWind widget – its easy to set up so there is every reason to give it a try!